On December 12, 1992 Jorge Torres won the Junior Olympic cross country championship for 11 and 12-year olds in Mobile, Alabama. His call home to his twin brother Edwardo, who hadn't taken up running yet, had a lasting effect. "I could hear him being all happy and satisfied," says Edwardo. "I don't think I knew what nationals meant until then: every kid my age in the United States. At the airport the next day he came off the plane with a big trophy and I thought, 'Wow, I want to do that too.'" Edwardo started running soon after Jorge's return from Mobile. By the time they graduated from Wheeling High School in Wheeling, Illinois they made a total of seven appearances at the Foot Locker cross country national championship. Jorge is the only boy ever to qualify for four Foot Locker finals. In 1998, his senior year, he won the event. Edwardo finished 6th in 1997 and 1998. The brothers continued their running careers at the University of Colorado where they helped the Buffaloes win their first NCAA cross country championship in 2001. A year later, Jorge won the individual title in a thrilling victory over Alistar Cragg in, what author Chris Lear called, "a race for the ages." Edwardo finished in 10th place making them the highest placing twins in NCAA cross country championship history. Jorge was undefeated his senior season. 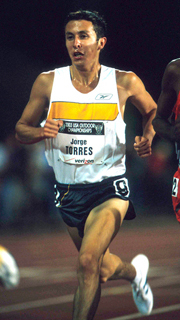 In 2003 Jorge was ranked #1 in the U.S. by Track and Field News in the 5000 meters clocking a personal best 13:24.17. Edwardo posted a personal best in the 10,000 meters finishing 8th at the USATF Outdoor Championships in 28:21.46. Jorge Torres credits his parents with the work ethic he and Edwardo have. "My father came here when he was only 14. He worked as a migrant worker in the fields around Michigan and Ohio for a couple of years, and then he worked in a factory in Chicago for a few years. My parents saved enough to open Torres Jewelry in 1980, the year we were born. It was a small store with only one showcase of jewelry, but now it is three stores. Growing up we'd help out with little things. I don't remember watching Saturday morning cartoons. Our father taught us a nice work ethic. Both our parents did." Ed and Jorge reside in Boulder, Colorado where they live with former University of Colorado teammate and 2003 NCAA cross country champion Dathan Ritzenhein. Click here to read more about the Torres twins!